Yelena Belova is an agent of Russian Intelligence. It is likely GRU, or the modern equivalence, that employs her since it was that organization that ran the infamous "Red Room" project. That challenging course was designed to take highly gifted women, train them to a level just below super-human, and then send them out as incredibly skilled agents able to handle virtually any assignment. The first "star" of the program had been Natasha Romanova, a person so very good that the people running the show gave her the title of the Black Widow, a sobriquet she took to with considerable pride. For a while she served the Motherland proudly but over time she began to have doubts about the missions and even more so about her leaders and eventually she "turned traitor" and joined the other side. A few other ladies may have come forth from the Red Room program after than but none compared to Belova who was so very good that she was also given the title of Black Widow, probably because the Red Room project felt they had rights to it and the previous one, though still using it, did not really own it. So they dubbed Belova the new Black Widow and sent her out into the world to earn it. The first we learn of her existence was a brief mission to pass along a message to a man from her boss, Colonel Yuri Stalyenko. She does so by landing on his parked car as he leaves work, dressed in black spandex with long ruly blonde hair. She is confident and self-assured and even looks like she is enjoying her job. That same year her job takes her up against the original Black Widow in a mission to a Third World country whose dictator is a nut case with a nasty gas he got his hands on that turns breathers into rampaging kill-machines. SHIELD wants it taken away from him. So do the Russians. Belova also wants the chance to dispatch most earnestly the previous Black Widow both for being a traitor and to give herself full rights to the title. The relationship between the two Widows is a classic old-vs-new, veteran-vs-newbie one but it does a great job in showing how good the Red Room project had been in finding quality students and making them really good at their craft. Belova, as the newbie, is fervent in her drive to serve her boss and make the elder pay for turning from them. Romanova, as the veteran, has been there and done that and is more than a tad tired. Despite their differences though, both are very good at being a Black Widow. Over time, the new Black Widow would learn how to not trust the motives or actions of her leaders for no matter how patriotic their words might sound, they often mask less than honorable goals and objectives. Belova would also learn that while she would not likely become BFF with the older Romanova, they could coexist with respect. And Belova could leave the Black Widow program behind. In the comicbook universe, new writers come along with new ideas and new uses of "old" characters and someone got the crazy idea to bring her out of a very young retirement and give her some strange concoction that greatly enhanced her powers and turned her into a nut-job. After that, things got crazy and left the realm of spy-fi into that of superheroes and supervillains. 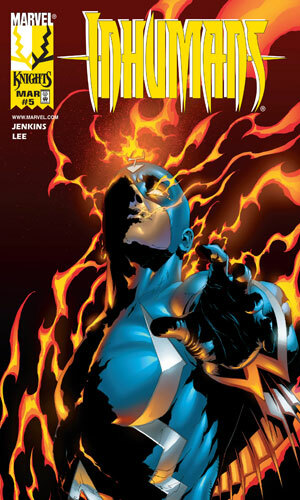 In Marvel Knights - The Inhumans #5, a very short introduction is given to a blonde Russian operative sent to deliver a message. She does so in a dramatic manner and then leaves, identifying herself as the Black Widow. The original Black Widow is on a mission to Rhapastan where a nutsy leader is planning on using a nasty virus that turns victims into rampaging killers. Also heading there to get the same serum for Russia is the new Black Widow, Yelena Belova, who also plans to kill the first Widow for being a traitor to Russia. Nick Fury wants to know what a certain Russian spy-master is up to and Natasha Romanova wants to get the new Black Widow, Yelena Belova, to understand what being a spy in today's world is really like. They join in a plan that involves changing the faces of the two ladies so both look like the other. 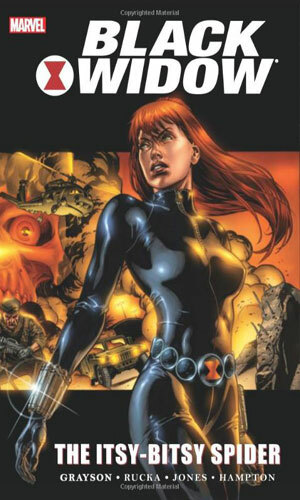 Published under the Marvel MAXX imprint indicating more mature content, this tells the story of how Belova was trained to be the replacement for the defecting Romanova as the Black Widow. 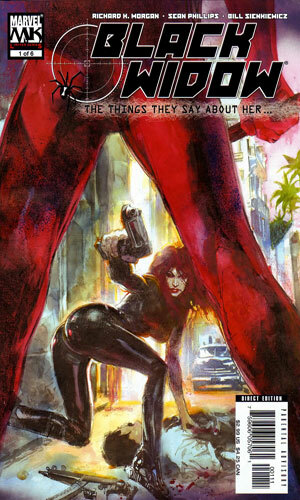 The original Black Widow (Romanova) heads to Cuba to meet up with the new Black Widow (Belova). 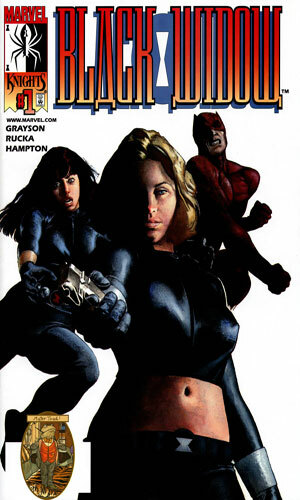 Did the world need another Black Widow? Apparently. When I first saw there was a replacement for someone who had not left the stage, I had a "huh?" moment. Then I started following the storyline and saw what was behind it and changed to "well, duh!". It makes sense that since the first Black Widow turned "traitor" to the Red Room people, they would want a replacement. And it makes great sense that they would fill her head with the notion that the original was bad and she was good and if she could take out the first, that would be better. So I liked the new one and what they did with her. For a while. Then just like the original, some brainiac (oops, wrong company) decided to take her whacko and mess up a good character. It happens! Still, the first three collections are darn good and well worth hunting down.